Time for renewal. We have had the barn re-wired and actually are still in the process. Two sets of wiring had to be removed, one old, and one was the current wiring that is now replaced. Dan and I have spent a minimum of 20 hours removing “stuff” from the ceiling of the barn. Things such as an iron railing that a manure cart used to ride on. Considering the load it had to carry it was firmly attached and had been for more than a hundred years I would guess. 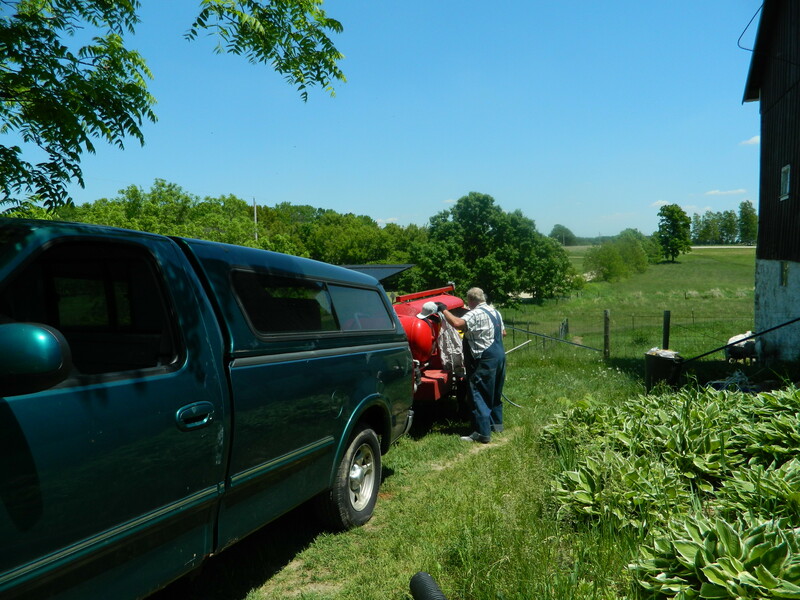 The barn did not have gutters as far as we can determine but the cart would be filled and pushed above the floor to a manure cart and dumped, over and over again. Also on the ceiling were hundreds of nails in the old beams. Who knows why they were there but they made perfect places for barn swallows to hang a nest. They were so rusty and old that most of the time I would only have to bend them a few times and they would break off. 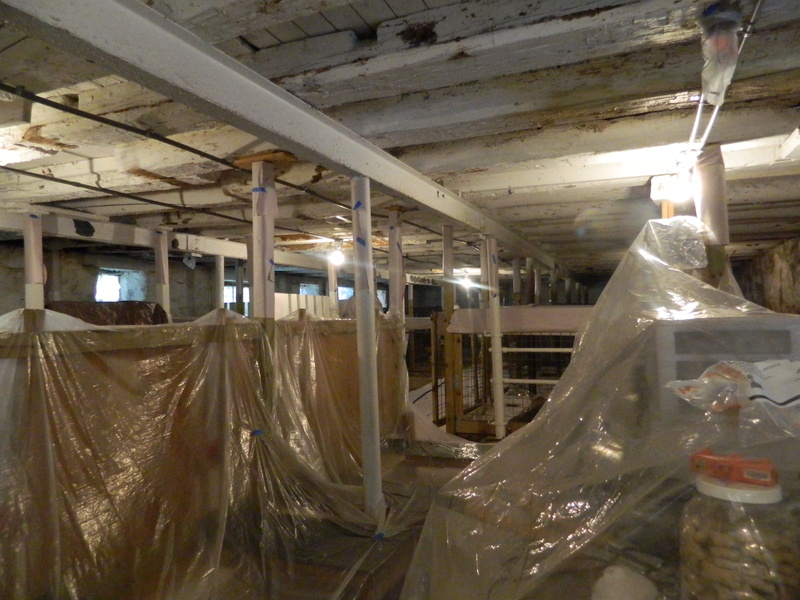 All of this to prepare for whitewashing and the next step which will be all new lighting fixtures. 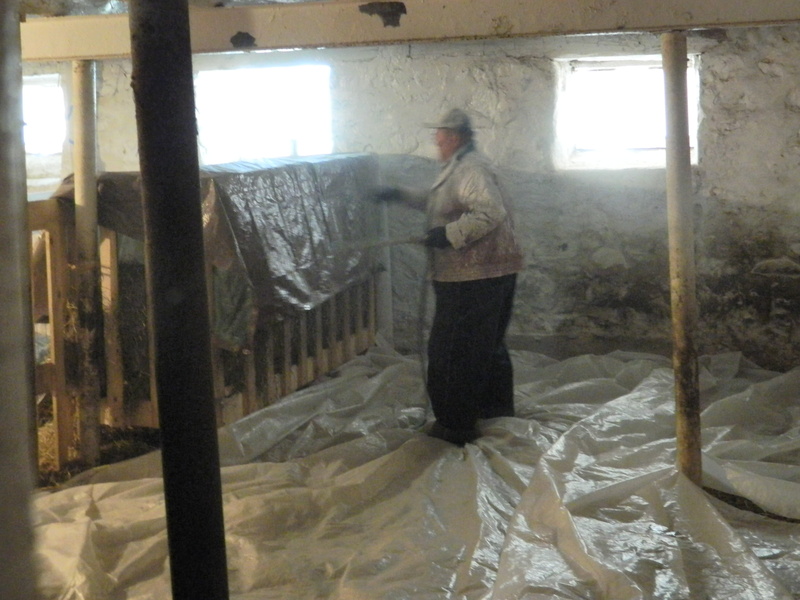 White washing is a very old and respected way to purify a barn. Unfortunately with new pole buildings rapidly taking place of the old stone foundation dairy barns it is not as common anymore. The chemical make up of the white wash and the PH destroy bacteria and encapsulates anything growing or thriving on the walls or ceiling.The PH is unfriendly to parasites. 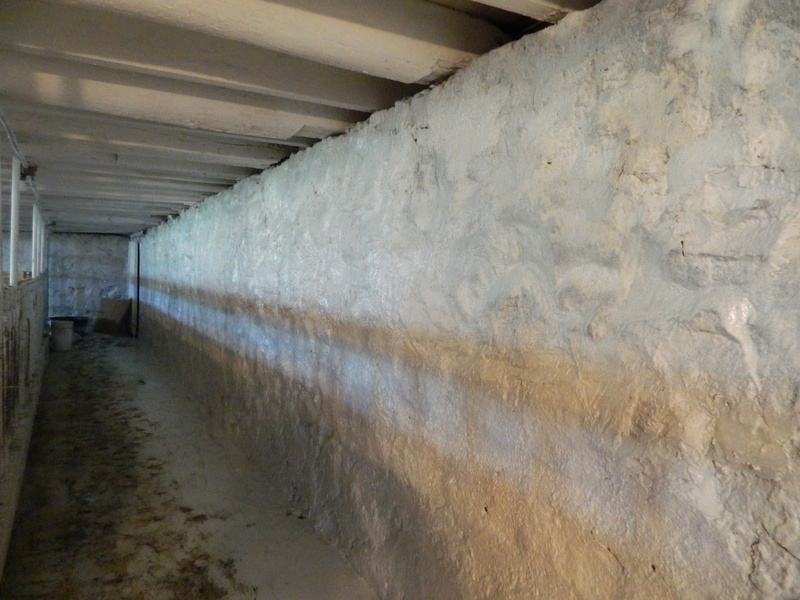 It is similar to bedding down a pen with barn lime as part of the bedding foundation of lime, shavings, straw. White wash is a form of lime. It is non-toxic and if the goats lick it they won’t get sick. It is also known as Limate. Below are some photos of the process including draping the barn and the finished barn. The tub of whitewash takes an hour to prepare. 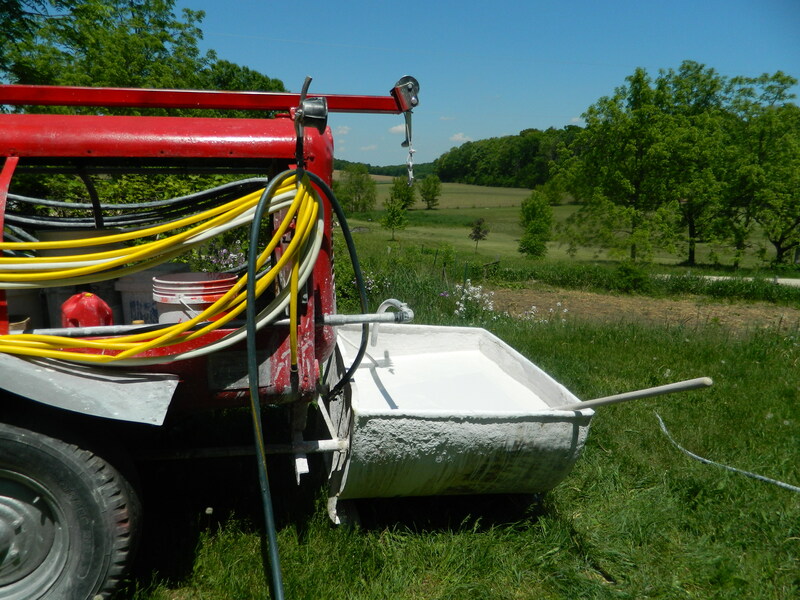 It will take this entire tub to whitewash my barn. In the process it will go a lot of places it shouldn’t as it is being sprayed, like on the floor, but it won’t do any harm and will wear off quickly with all the activity in the barn. Below is the parlor draped before spraying. This is the wall that was the worst wall in the barn. 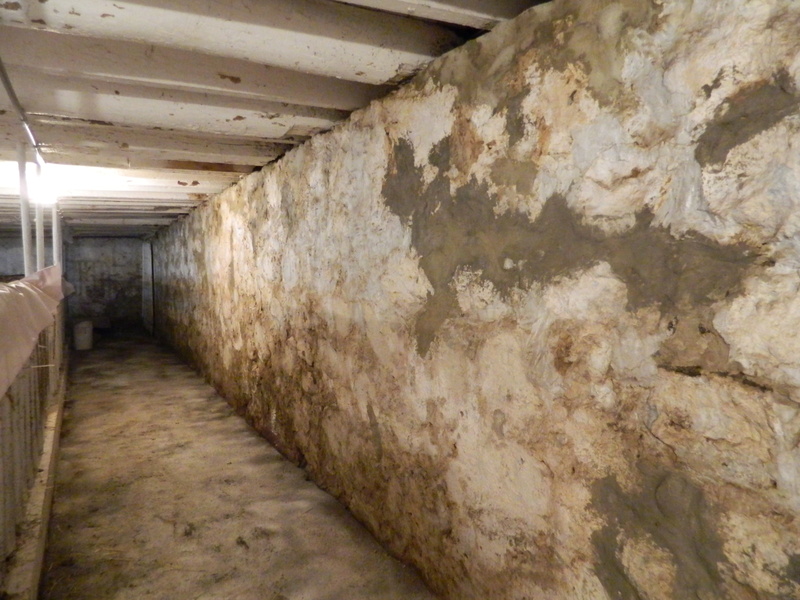 It needed tuck pointing and because it is the wall that is unexposed and underground it looked pretty bad. Above is a before and after. Once the wash is dry it is hard and shiny. It is as good as paint, but it is better since it has qualities that paint does not have. In the above photo it is not yet dry and after it dried it got a lot whiter. The last time we had the barn whitewashed was 5 years ago so it was time . It was a huge chore with a lot of preparation but I am pleased to have such a white clean looking barn. Not bad for a barn that has seen more than a hundred and thirty years of use.